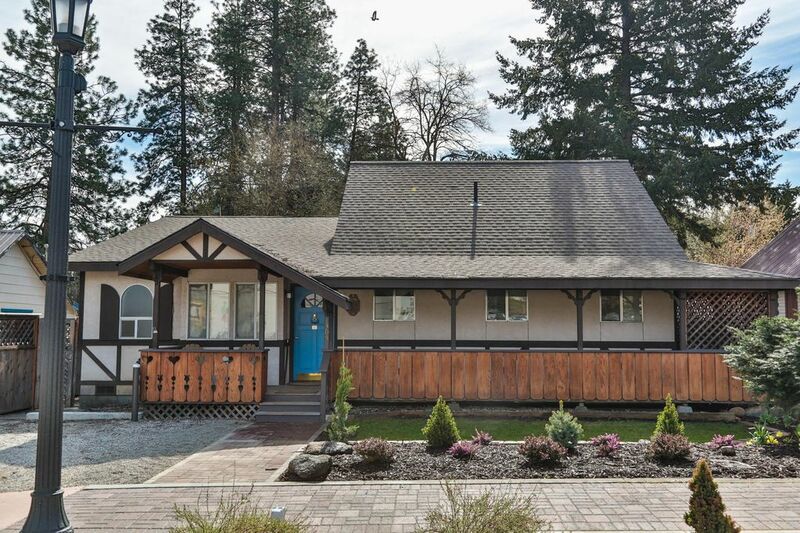 One block from the activity of beautiful downtown Bavarian Leavenworth, the Cottage in Town blends into Commercial Street and is an oasis of relaxation. Large enough for a family, perfect for a romantic get-away, this beautifully decorated and easy floor plan with a large fenced yard & hot tub, provides a perfect honeymoon, anniversary celebration, or small-family vacation. Fully furnished, you can enjoy the comforts of home, steps away from Leavenworth. This house is right in town, walk to all the shopping and dining. Exquisitely appointed, this delightful home is perfect for anyone looking to get away from the big city for a weekend, or an entire week. There are three bedrooms to sleep up to 6 people comfortably. A nice dining room and a complete kitchen make this your home away from home. The convenient location is perfect if you are visiting on a festival weekend, skiing at Mission or Stevens, or just coming to town to take advantage of all four seasons and everything the area has to offer. Raft the Wenatchee River, Float the Icicle, Take the family to the Leavenworth Ski Hill, or just relax. The home is fully furnished with all linens, fixtures and amenities. Plus there is an always Welcome (Wilkommen) hot tub too. A great way to end the day. Our base rate is for 4 guests, each additional guest is $25 per person, per night. This home has been in our family and we enjoy our family time and sharing our home with others who love the Leavenworth area. This home has been in our family for years. Our base rate is for 4 guests, each additional guest is $25 per person, per night. Great place to stay, we will come back! We were in town for a ski comp with 3 adults and 3 kids. Perfect size house, the 3 kids slept upstairs. There is a little empty spare room up there that is the perfect size for a camp bed and a 10 year old. Kitchen is well stocked, house is nicely set up and comfortably furnished. Owners were easy to communicate with, but we didn't need to at all, just to make the reservation. Thank you so much! Oh, parking for one vehicle in the driveway and 2 on the street, but can't park there in the winter 3am-7am, so we parked a vehicle in the market lot overnight without a problem. The house is perfect for 3 couples or less. We have stayed here before and hopefully will stay here again!! Very comfortable with everything you need for your stay. This was our second time staying here. We meet here with our extended families and share the house. It’s a great time! We had a great time. House was great. Location was fantastic. Would definitely stay there again! The Cottage was the perfect spot for a winter holiday getaway in Leavenworth. Conveniently located across from Dan's Market and only a 5 minute walk to the shops in town. The Cottage was cozy, comfortable and well equipped. We would definitely stay here again. Please note we only take payments through Home Away/VRBO "Book It Now". In order to make any other arrangements you should make sure you talk to me directly, I do take Visa/MC or Paypal but we do not do wire transfers and direct contact to myself at 509-433-1020 is appropriate. By inquiring with us, you give us the right to email you about our property. We will not sell your email to parties.